Good News for the dog lovers! Dog Day is right around the corner - August 26th, which brings forth a big opportunity to reach out to dog lover friends. If they have a myspace profile, just move a step ahead and pimp their profiles with the Dog Day comments. There's no better way to wish them and their dogs than this. It's there day and they need some special treatment. So what's your plan to make their day a really memorable one for them? Serving them their best meal is obviously the best way to treat them in the way they would love. Click here to get some really special treat for your dog. Hello friends! 4th of July is right around the corner, there's nothing like celebrating it with the sizzling BBQs and firework glory! 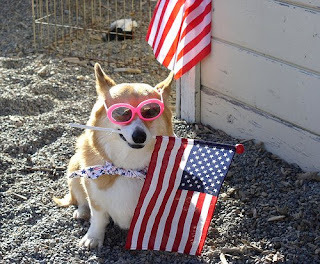 Celebration of nation's birthday should really be a colorful extravaganza but that should never harm pets. Whether you own a pet or not, playing with fireworks has to be safe for you, and for pets too... be it yours or your neighbor's! If you are planning to arrange for a firework display, choose a venue away from where your pets are kept. Don't take pets away from your house. Keep them indoor and if possible turn on your television louder, as a measure to overlap the cracking sounds of the fireworks. Surveys show that the 4th of July - American Independence Day - has been the most traumatic day of the year for pets - especially dogs and cats. So it's the time to prove that you are a responsible pet owner. It's not only by taking proper care of your own pet that you can prove your degree of responsibility towards pet. A lot is still left! Convey your thoughts and messages to your pet lover pals and let them know that you care for their pets too! Hey pet lovers! Guess what? Another wonderful pet loving day is right around the corner. Yes, Hug Your Cat Day is almost at the threshold - May 30th. Make your cat feel special and pampered this special day. Cook him some special treat and give him a grand surprise. Being an animal lover doesn't mean that you have to have a pet at your home. Whether you have a pet or not - doesn't matter! Just reach out to your heartfelt messages to your cat loving pals and their beloved cats. Check out these cool cat comments that hold the spirit of Hug Your Cat Day to the fullest extent. Just as the 'Hug Your Cat Day' (May 30th) is waiting around the threshold with loads of opportunities to make your cat feel special, my neighbor Jeffrey burst out with tears due to loss of his pet. He lost his pet Labrador, Jasper. Jasper was the darling of all of us. For the last twelve years we used to see him every morning at the park with his master. I have never seen such a friendly dog in my whole life. Just cuddle him for a moment and he will be the best friend of you for the rest of the life. There was not a single child in our area who has not played with Jasper. I can understand how painful it is for Jeffrey to cope up with the loss of Jasper. I just sent this loss of pet ecard to Jeffrey, hoping this might bring him some solace to him. If you know somebody who is suffering from the pain of losing his or her pet, send him or her some of this awesome pet cards, personalized them with your very personal messages. This will definitely reduce his or her pain... trust me. Hi fellow pet-lovers! We are at an important time of the year - Mothers Day is just a few sleeps away. I explained to you in a previous post why I am talking about Mothers Day on a blog that is devoted to pets. Pets fall in the purview of a mothers love quite comfortably. Mothers are specially attached to the pets around the house and pets know that it is the mom who will feed it and pay attention to all its demands. So, when hungry, the pet inevitable wags its tail in front of mom. Similarly, a mother treats the pet as a child. Wish your mom the very best of Mothers Day 2008. She deserves it for all the obvious reasons along with the fact that your pets get the maximum love and attention from her. Hello pet-lovers! With the advent of May Day, the month declared by the ASPCA as prevention of cruelty to animals month will come to an end. That, however, should not be the end of your resolution to try and stop cruelty on animals. That can never take a back-seat, with you pet-lovers alive and kicking. Pets touch our lives in a very special way. They can go a long way in releasing mental tension and a gentle wag of the tail from your pet can make you forget all your cares and worries in a jiffy. Take advantage of this amazing influence of pets on human being and wish your friends with these wonderful pet comments cards. No sweat involved, just click on the cards I'm putting up for you and see the difference in your friendship. I'd be very happy if I can help you in some way. Hello pet-lovers! Cuckoo Day is here and it falls in a month that has been declared by the ASPCA as the Prevention of Cruelty to Animals month. So all you pet lovers must take this opportunity to wish your friends and family a very happy Cuckoo Day and extend your love for pets to non-domestic animals as well. Click away on these cards to wish your mates the very best of this day and it'll be a lot of fun as well. Hi friends! As you are already aware, April is the month of Prevention of Cruelty to Animals. However, people are still indulging in lots of activities which amounts in cruelty to animals. Take your pets to vets when they fall ill. Don't ignore their little illnesses as they might culminate in complicated ones and result in a lot of suffering for the animal. Treat them well, give them proper food and take them out for walks in an open space. My heart pains to see the ill treatment meted out to pets by insensitive people. Click on these pet cards and wish your friends and loved ones. Don't forget to embed a message that will make them aware that it is the month of Prevention of Cruelty to Animals.